Dustin S. Baumbach & Stephen G. Dunbar, Ph.D. Many animals are known to exhibit either small or large scale movement patterns for migration to different feeding or nesting habitats. But, it’s both time consuming and expensive for researchers to track animal movement patterns for assessing potential conservation management of a particular species. Sea turtles provide an excellent example of a species with long distance migrations from foraging to nesting beaches and vice versa. Adult male and female sea turtles set up foraging home ranges where they’ll spend the majority of their time to gain energy stores for migrations to mating and nesting beaches. Turtles may travel several thousands of kilometers away from their foraging grounds to reach nesting beaches. However, this long distance migration can only be tracked by using satellite trackers that are placed on the turtle’s shell and then transmit location signals as the turtle surfaces to breathe. These points are then plotted on a map by the researcher to determine the path of migration. reporting data collected on nesting females to the Ocean Biogeographic Information System Spatial Ecological Analysis of Megavertebrate Populations (OBIS-SEAMAP), an online database that spatially references sea turtle data and offers environmental factors for optional analysis. However, this map is only available for upload to sea turtle researchers. Geographic Information Systems (GIS) are currently becoming increasingly more popular as a form of spatial data collection and analysis. But, without training, most GIS applications may be difficult to figure out by untrained users. A common approach to using GIS is to have volunteers collect location data which the researcher then plots in a GIS. An example of this includes using local fishermen to log the location of lionfish sightings to determine the extent that this invasive species has colonized the Caribbean Sea. Few studies have used volunteer tourists or recreational participants to both easily collect and map data specified by the researcher. Reasons for this include skepticism by scientists about the accuracy of data that’s collected by non-scientists, even though data collected by citizen-scientists are almost as accurate as those collected by scientists. The WhaleMAPP focuses on using whale watchers on a global scale to log whale sightings of different species and upload tail photographs. Recently, we created a similar web map that utilizes diver tourists to log sea turtle sightings by dive site on the islands of Roatán and Utila in the Bay Islands of Honduras. However, many people do not have immediate access to computer based web-maps in areas where turtles may be seen. Due to the isolated areas where turtles occur we decided it would be beneficial to create a smartphone application for immediately logging turtle sightings. We realized the untapped global potential for building a smartphone application for users to log sea turtle sightings and upload photographs either after diving or snorkeling, or while patrolling nesting beaches, to contribute to a global database of sea turtle sightings. 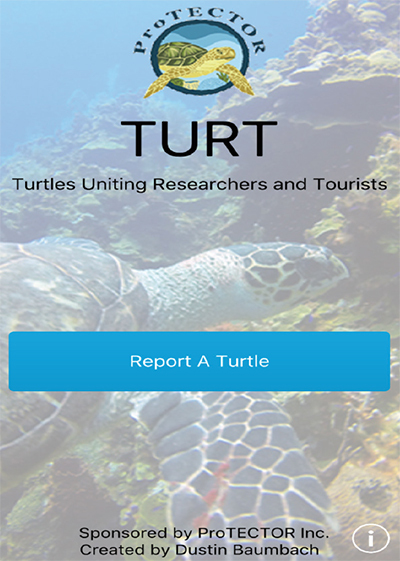 After assessing what the main objective of our sea turtle sightings app was designed to do, we decided to name our app TURT (Turtles Uniting Researchers and Tourists). TURT was created using a combination of ESRI products, including ArcMap, ArcGIS online, and AppStudio for ArcGIS Online. A feature layer was first created to specify the types of data that are to be collected by tourists and to symbolize all seven species of turtles, as well as an ‘undetermined’ category added for those that may not be able to identify sea turtle species. This feature layer was then uploaded to ArcGIS Online and then used in the app template of AppStudio for ArcGIS Online. On startup, TURT displays a welcome page (Fig. 1) shown with the Protective Turtle Ecology Center for Training, Outreach and Research Inc. (ProTECTOR Inc.) logo/link and prompts users to report a turtle. Next, the user sees another screen prompting the user to take or upload a photo, followed by a map to refine the location the turtle was sighted. 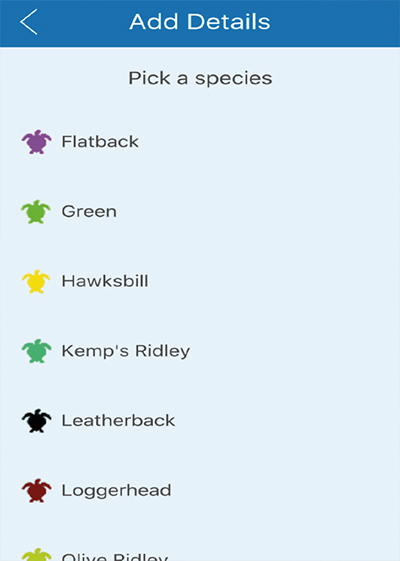 Once the location is positioned, the user is asked to fill out a form asking for species observed (Fig. 2), identifying characteristics, and other important information. The sighting is then displayed on the next page after submission. However, all identifying characteristics are omitted to protect the precise location of turtles from potential poachers. 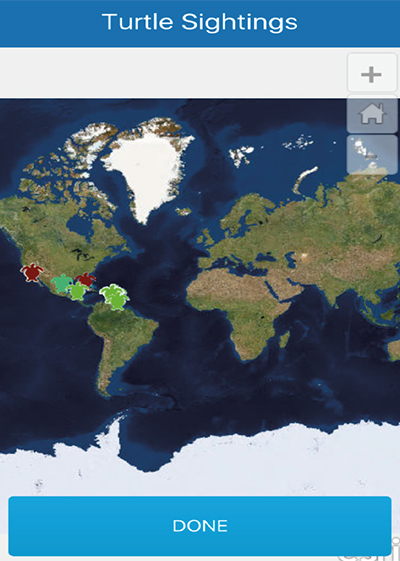 Custom coding was used to modify the functionality of the app and to display the results of all currently logged turtles on a map for users to view at the end of logging their sighting (Fig 3). We realized that users would enjoy seeing their currently logged sighting and how this sighting fits into the global contribution of sea turtle data. Currently, TURT is available for both android (in the Google Play store) and for iPhones, iPods, and iPads for Apple users (in the App store). As we continue to think about the development of TURT and how users may interact with it, we realize the importance of continued updates to provide positive citizen-scientist interactions. Currently we are focusing updates on providing multiple photo uploading and to provide offline access for users in remote areas without Wi-Fi. The next application that’s currently being developed is for researchers to collect their own nesting or in-water capture data to be logged into an online database, replacing paper data sheets, and that may be accessible to sea turtle researchers world-wide. Although GIS has the potential to be difficult for the untrained user, recent developments in web-based and smartphone applications have simplified this process by providing easy to use editing options. The use of GIS will help researchers analyze spatial and movement patterns both within and among species that may not have been previously discovered. Citizen-scientists represent an untapped source of data collection that can aid researchers in quickly gathering large amounts of data to build up a global sea turtle database. 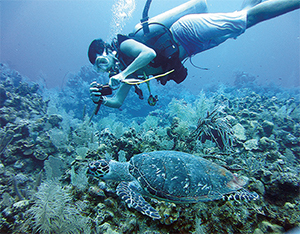 TURT helps to link researchers and tourists (citizen-scientist). We developed TURT as a result of realizing an increasing need to create a global sea turtle database, and as a way to easily share data among researchers and with the public. TURT is currently the only interactive smartphone application that allows citizen-scientists to personally collect and map sea turtle sightings data. We anticipate that citizen-scientists will be enthused about working with researchers to contribute to understanding more about the sea turtles of our world.